I introduced the third graders to this idea and there were a lot of stabs at trying to figure out this whole drafting thing that writers do. There were some heels dug in — “I am going to make a book and you can’t stop me,” was the body language of one girl. (I thought to myself, I might not stop you this time, but eventually you’ll write drafts.) The following day I brought in this interactive chart. I wanted to help make the process more visible to them, as well as help them individualize it. (The following day we added magnets with each student’s name so they can show where they are working in the writing process. 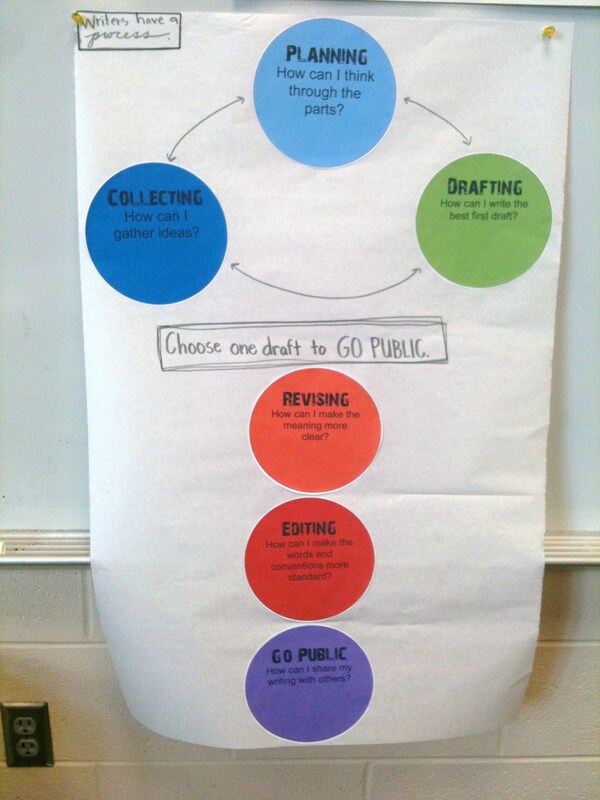 Interactive writing process chart that encourages students to draft more than they publish. 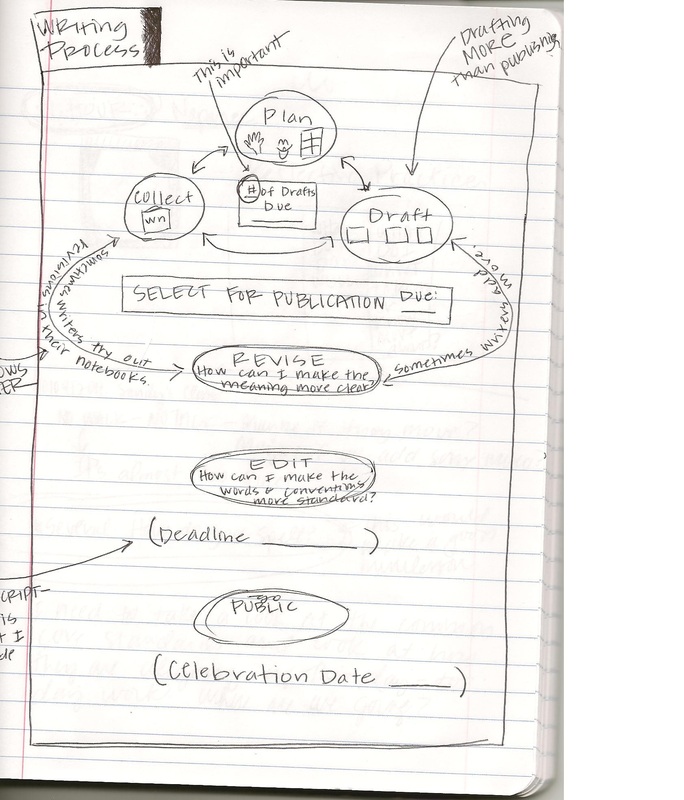 Interactive writing process chart from last year. Notice that it goes in a straight line. In their earlier experience (grades k – 2), students pretty much “marched” through the writing process as they made books. Younger writers layer their revisions and editing on top of the drafting and planning. In the end, they can “fancy up” their book before making it go public. 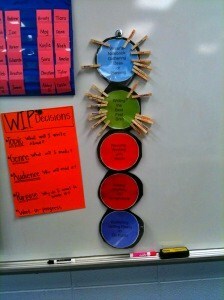 For the most part, though, they stick with a book until it is “finished.” Here are the circles for a primary interactive process chart. As students gained experience, we’d encourage them to spend more time in planning and drafting then selecting the draft that they wanted to spend more time polishing. I think the more recent chart does a better job helping students think through the process of collecting and drafting, collecting and drafting. In the more recent chart (top picture) I split the envisioning phase into planning and collecting. I think this helps students be more intentional about making a plan. Here are the circles for a more sophisticated interactive process chart. A page from my reflective journal. The straight line chart has been one I’ve used for years. I could have kept using it, but as my thinking changed, I want the resources I use to change and evolve too. Here is a page from my reflective practice journal where I’m attempting to sort out my thinking. You’ll see there are ideas in my notebook that aren’t on the chart I introduced to the third graders. However, that doesn’t mean that I won’t eventually share these nuances with students. Maybe in third grade, or maybe in upper grades in order to nudge students into refining their writing processes as they mature. The video is going to have to be what it is. I’m was fighting a major cold…this is the first time I’ve given this lesson…the first time I’ve used this chart…and I’m trying to find the words that will help them understand this new layer to the writing process. I’m nudging them to try drafts and I’m conscious that I don’t push them over the edge. I also recorded it on a whim, so the quality is the best my little iPhone can do. If you plug in earphones, you might have an easier time hearing me. I hope this is helpful to a few people because between the video quality and my evolving thinking I’m getting a few butterflies thinking about making it public. The ultimate reason why I’m sharing it though, is because watching it has helped me understand the process a little more and I think it’ll help others. Plus it’s less than 5 minutes. In the primary grades around my school district, students are usually making books. This is based on Katie Wood Ray’s work in In Pictures and In Words: Teaching the Qualities of Good Writing through Illustration Study , her work along with Lisa Cleaveland in About the Authors: Writing Workshop with Our Youngest Writers, and Martha Horn and Mary Ellen Giacobbe’s Talking, Drawing, Writing: Lessons for Our Youngest Writers. There are other books and experts we’ve read, but these are some of the key ones in altering our thinking. This is not to say they are making books because we believe writing a Book (with a capital “b”) is the end all be all, but because that is the container that is most appropriate for young children. They also write friendly letters and cards and poetry and some even dabble in comics. The third graders are missing making books (and, really, can we blame them?). I’ve said, “When you go public, one way is to make a book.” My guess is at the end of this narrative unit of study, most will make a book. This is not the only way they will go public; however, it is the way most are comfortable with at this point in time. I can’t believe the incredible drafts these 8 year olds are writing. Those who have had solid teaching around illustration are using their background knowledge of making meaning in illustration to craft words that are beyond what I’ve seen eight year old writers draft in the past. It is exciting and I’m sure I’ll be posting more on this. I’ve been thinking about the elimination of the term “sloppy copy” and I couldn’t agree more! Experimenting with or drafting a new story is much like visiting a new country without a tour guide. In this new and sometimes strange environment, you can’t proceed sloppily or haphazardly. You stay on your toes, you listen, watch, ask questions and proceed in a more measured way, and when the road you’re on doesn’t lead you to where you think it should, you try another route. I love the process you’ve modeled as it reflects more accurately what authors do day to day. Thank you! I love your chart! And your website! 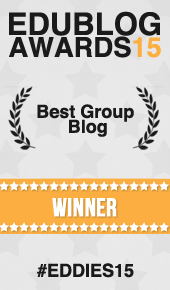 I gave you an award over on my blog. Keep up the GREAT work, gals! Thanks for this. I’m going to adapt a bit for my older writers, but this is great! I’m helping a teacher approach these transitions with his class, so will share this and discuss the possible implications for his lessons. Thank you for all the process explanation and the actual circles. It will be useful! Thank you for posting this. I teach 5th grade and I find this very helpful…thank you for sharing!